Try your hand at carrom on Thursday 9 May from 7:30 p.m. in Bike Jesus, Orebitská 5, Praha 3. We’ll be happy to teach you how to play. Bring your friends or come by yourself – everyone is welcome. This year’s Eurocup will be held in Bad Honnef in Germany on 1–5 August. The Czech Carrom Association will be sending a small but experienced team. The Czech Junior Championship was held on Friday 29 March, attracting almost thirty players. In the closely fought final Martin Sochor (Pelhřimov) was victorious over Vít Sysr (Letohrad). The Spring Tournament, the first of three tournaments in the 2019 Czech National Championships series, was held on Saturday 30 March. The final was between Zdeněk Sviták (PCL) and Karlos Novák (CML). In the first few boards the players seemed evenly matched, but in the fifth board Zdeněk scored eleven points and it seemed as though the match was over. However, Karlos fought back to bring the score to 21:19. The dramatic conclusion saw plenty of errors by the nervous finalists, but ultimately Zdeněk proved luckier and more accurate. Franta Rezek (PCL) finished in third place. You can view photographs from Pelhřimov here. We thank SPŠ a SOU Pelhřimov for organising both tournaments, and the town of Pelhřimov and the Vysočina region for their support. Try your hand at carrom on Thursday 17 January from 7:30 p.m. in Bike Jesus, Orebitská 5, Praha 3. We’ll be happy to teach you how to play. Bring your friends or come by yourself – everyone is welcome. After a thrilling final Tadeáš Matys beat Zdeněk Sviták to win the 2018 league. The last few matches and the prizegiving ceremony will take place on December 6 in Bike Jesus, Orebitská 5, Praha 3. The tournament was held on Saturday 17 November, with Czech, German and Polish players competing. Dirk Polchow and Sylwester Pogorzelski made it the the final, with Dirk the ultimate winner. Third place went to Bartosz Sasinski while the best Czech player was Karlos Novák in ninth place. Full results here, and photographs here. Thanks to everyone who took part and we’re looking forward to 16 November 2019. Horst’s victory in the Second Tournament sealed the championship. Congratulations! The Autumn Junior Tournament was held on Friday 5 October. As in the spring, the final was between Tomáš “Tomík” Chmelař from Pelhřimov and Rotislav Borský from Prague, with victory going to the latter. Full rankings here. The Second Tournament took place on Saturday 6 October. The winner was Horst Šimunský, who had also won the Spring Tournament and therefore became the Czech Carrom Champion for 2018. Both tournaments were hosted by Letohradské soukromé gymnázium. The AGM was held on 5 October 2018 in Letohrad. The highlight of this year's carrom season is the 5th Carrom World Cup on 23-29 August in Korea. The Czech Republic will be represented by Horst Šimunský, and we wish him every success. The next two rounds of the PCL on 16 August and 30 August will be held in Unijazz's reading room, Jindřišská 5, Praha 1, starting at 7 pm. We are still looking for a new, more permanent home. The European championships were held on 21-25 June 2018 in France. Pierre Dubois (FR) held on to the trophy, with Karnal Abdin (UK) finishing second and Lorenzo Hürlimann (CH) in third place. France won the team event, followed by the UK and Poland. The best Czech player was Zdeněk Sviták, who finished 56th. You’ll be able to play carrom in Unijazz’s reading room at Jindřišská 5, Prague 1 on Monday 18 June from 7 pm onwards. We’ll be happy to teach you how to play. Bring your friends or come by yourself – everyone is welcome. Try your hand at carrom on Thursday 17 May from 7:30 p.m. in the Tercie café, Zborovská 37, Prague 5. We’ll be happy to teach you how to play. Bring your friends or come by yourself – everyone is welcome. The tournament season again started in Pelhřimov. The 5th Czech Junior Championship was held on Friday 6 April, and the winner was Rosťa Borský from Prague, with Tomík Chmelař and Kryštof Melmuka, both from Pelhřimov, finishing second and third respectively. Fourth place went to Míša Pavelová, the best junior player from Letohrad. Full results here. The Spring Tournament, the first of three tournaments in the 2018 Czech National Championships series, was on Saturday 7 April. In the final Horst Šimunský played a flawless game to beat Tadeáš Matys. Full results here. Both tournaments were organised by SPŠ and SOU secondary school in Pelhřimov, in collaboration with the Czech Carrom Association and with substantial support from Pelhřimov and the Vysočina Region. Try your hand at carrom on Thursday 18 January from 7:30 p.m. in the Tercie café, Zborovská 37, Prague 5. We’ll be happy to teach you how to play. Bring your friends or come by yourself – everyone is welcome. The largest Czech tournament took place on Saturday 18 November 2017 in Prague. The final was between Sylwester Pogorzelski and Bartosz Sasiński, both from Poland, with Bartosz victorious. Third place went to Illi Anders from Switzerland. Zdeněk Sviták is the 2017 Czech Champion. His victory in the Second Tournament sealed the championship. Congratulations! The full rankings are here. The trophy from the Autumn Junior Tournament went to Dominik Vlček from Pelhřimov, who in the final beat Jakub Moravec from Letohrad. The junior rankings are here. Zdeněk Sviták won the Second Tournament in the 2017 Czech National Championships series, making him the 2017 Czech Champion. Second place went to Neel Vasanth while Tadeáš Matys finished third. The AGM will be held on 21 September 2017 from 6 p.m. onwards in the Tercie café, Zborovská 37, Prague 5. Try your hand at carrom on Thursday 21 September from 7:30 p.m. onwards in the Tercie café, Zborovská 37, Prague 5. We’ll be happy to teach you how to play. Bring your friends or come by yourself – everyone is welcome. LSG (Letohradské soukromé gymnázium) will again host carrom tournaments on October 6-7 in Letohrad. The Autumn Junior Tournament will take place on Friday, followed on Saturday by the Second Tournament in the 2017 Czech National Championships series. Please register here by September 30. The 21st Eurocup was held in San Michele all Adige in Italy at the end of July. Nine players from the Czech Republic competed in three categories (singles, doubles, team). A youthful Czech team comprising Tadeáš Matys, Franta Rezek, Ondřej Chmelař and elder statesman Filip Smoljak finished seventh in the team competition. We thank the artist, Monika Horčicová, for her hand and inspiration. More photos in the gallery. Anyone who wants to try carrom is welcome to come to the Trilobit café at Zborovská 37 in Prague 5 on Thursday 18 May from 7.30 pm onwards. The 21st Eurocup will be held in Italy on 27-31 July. More information here. The Czech Junior Championship will be held on Friday 31 March. It will be followed on Saturday 1 April by the Spring Tournament, the first in the Czech National Championships series. Both tournaments are organised by SPŠ and SOU secondary school in Pelhřimov in collaboration with the Czech Carrom Association. The registration form is available here. Please register by 25 March 2017. Anyone who wants to try carrom is welcome to come to the Trilobit café at Zborovská 37 in Prague 5 on Thursday 23 February from 7.00 pm onwards. Try your hand at carrom on Thursday 1 December from 7.00 pm onwards at the Trilobit café, Zborovská 37, Prague 5. Frank Fehr from Germany won the 11th Carrom Open Cup Prague, beating Sebastian Holtmann in the final. Full rankings are available here, and photographs from the tournament are here. Try your hand at carrom on Thursday 20 October from 7.00 pm onwards at the UŽ JSME DOMA café in Dejvice in Prague 6, which sadly will close at the end of October. On Friday 7 October the Junior Tournament was held in Letohrad for U19 players. In the final Štěpán Smoljak (RaF Praha) beat Dominik Vlček (SOU a SPŠ Pelhřimov). Full results are available here. The Second Tournament took place on Saturday 8 October. This time Štěpán Smoljak lost to Zdeněk Sviták in the final. The results here will count towards the rankings to decide the 2016 Czech National Carrom Champion. will be held on 22 September 2016 from 8 p.m. onwards at the UŽ JSME DOMA café in Dejvice in Prague 6. Everyone is welcome to come and play carrom on Tuesday 21 July from 7.30 pm onwards at the UŽ JSME DOMA café in Dejvice in Prague 6. There will also be photographs from the Eurocup in Prague. The 20th Carrom Eurocup was held on July 7–11. Our congratulations to the winners. We are grateful to Prague 3 and its Mayor Vladislava Hujová, Senator Petr Šilar, and the German Carrom Federation for all their support and assistance. Czech Television's report on the Eurocup starts at 113 minutes Studia 6. Everyone is welcome to come and play carrom on Tuesday 5 May from 7.00 pm onwards at the UŽ JSME DOMA café in Dejvice in Prague 6. Come by yourself or with friends. If you haven’t played before, we’ll be happy to teach you. Both tournaments were again superbly organised by the SPŠ and SOU secondary school in Pelhřimov,with the support of Vysočina Region’s Councillor for Education, Jana Fialová, and the Mayor of Pelhřimov, František Kučera. There were also varied side events, including a hairstyle fashion show by the school’s hairdressing students, a demonstration of ballroom dancing and a performance by Pelhřimov Youth Club’s majorettes. The Junior Championship was held on Friday 1 April and the results are here. The Spring Tournament took place on Saturday 2 April. Full results here. Everyone is welcome to come and play carrom on Thursday 25 February from 7.00 pm onwards at the UŽ JSME DOMA café in Dejvice in Prague 6. Come by yourself or with friends. If you haven’t played before, we’ll be happy to teach you. The first slam was scored by Tobias Krüger in the first round of the tournament, followed by Sylwester Pogorzelski in round six – you can see his slam here. The full rankings will soon be available here. The largest Czech tournament was held on Saturday 21 November 2015 at the Hussite Theological Faculty, Pacovská 350 in Prague 4. Sylwester Pogorzelski and Tobias Krüger met in the final; both had scored slams earlier in the day. Tobias beat Sylwester 25 : 11, winning the tournament for the third time. Photographs by Zdeněk Tichý are available here. The results of the tournament are available here. The tournament is supported by the Mayor of Prague 4, Petr Štěpánek. Everyone is welcome to come and play carrom on Tuesday 27 October from 7.00 pm onwards at the UŽ JSME DOMA café in Dejvice in Prague 6. Come by yourself or with friends. If you haven’t played before, we’ll be happy to teach you. 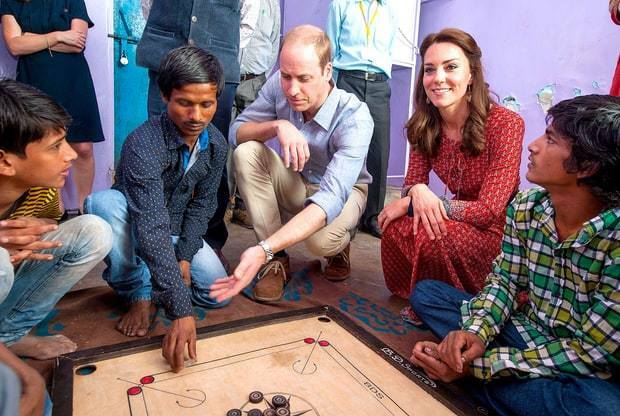 The Smoljak carrom dynasty dominated both tournaments held on 2 and 3 October. Štěpán Smoljak (RaF Praha) won the Junior Tournament on Friday, ahead of Lukáš Pavela and Míša Šilarová (both from Letohradské soukromé gymnázium) – full results here. On Saturday Štěpán fought his way into the final of the Second Tournament, where he lost 20:25 to his father Filip after a long match with 14 boards. Full results are here, and the rankings for the Czech National Championships after the Second Tournament are available here. Our thanks to Letohradské soukromé gymnázium, which organised the tournaments, and to competitors from SPŠ a SOU Pelhřimov. You can play carrom under the guidance of experienced players on Thursday 10 September and Thursday 24 September at the UŽ JSME DOMA café in Dejvice in Prague 6. We look forward to seeing you there! This year’s festival will take place on 12 September in Ladronka Park in Prague 6, offering more than 80 leisure activities, including carrom. Everyone is welcome – more information here. On the last weekend in August Europe’s top carrom players met by Lake Lungern in Switzerland to compete in singles, doubles and team events. In the team competition the UK finished ahead of Germany, followed by France – all teams had the same number of wins and the final ranking was decided by their scores. The best junior player was Bartosz Sasinski and the best woman player was Paulina Nowakowska, both from Poland. The Czech Republic had just three players at the tournament – Cyrus Skaria, Honza Těšitel and Tomáš Chmelař. More information on the Eurocup is available here. The singles results are here, and the doubles results here. Eurocup 2016 will be held in Prague. Štěpán Smoljak is the 2015 Czech Junior Champion, finishing first out of almost 30 competitors to repeat his triumph from 2014. The Spring Tournament was won by Tadeáš Matys, who beat Filip Smoljak 25:16 in the final. The SPŠ and SOU secondary school in Pelhřimov again did a great job in organising these tournaments. Both tournaments were supported by the Vysočina Region’s Councillor for Education, Jana Fialová, and the Mayor of Pelhřimov, František Kučera. We thank everyone involved and look forward to future tournaments. The event was covered in the local press. on 3rd October, and the 10th Carrom Open Cup Prague on 21st November. The Czech Junior Championship will be held in Pelhřimov on 27th March. There will be another Junior Tournament on 2nd October in Letohrad. The Czech Test Series will be played between selected players from the Prague and Medlešice Leagues between April and May. The 2015 Terrace Carrom Cup, an invitation tournament, will be held in Borek on 20th June. Susanne Schackert from Germany was made an honorary member of the Czech Carrom Association. The 2014 Second Tournament will be held on Saturday 27th September in Letohrad. For more information email mcr@carrom.cz . This event will be preceded by a junior tournament in Letohrad on Friday 26th September. The 18th Carrom Euro Cup was held in August in London with almost 100 participants. Full results are available here. The first tournament in the Czech Championship series was held in Pelhřimov on Saturday 29 March. In a closely-fought final Tadeáš Matys from Prague beat Darius Brožek from Pardubice. Zdeněk Sviták took third place. Full results here. Photographs by Zbyněk Fojtík here . The first Czech Junior Championship was held on Friday 28 March, and was organised by the Czech Carrom Association in collaboration with the SPŠ a SOU secondary school in Pelhřimov, with the support of the town and the Vysočina region. The atmosphere was superb and all 28 competitors played enthusiastically. In the final Štěpán Smoljak from Prague beat Adam Šimák from Letohrad to become the first ever Czech Junior Champion. Congratulations! Full results here. Photographs by Zbyněk Fojtík here. 2014 sees the launch of the Czech Junior Championship in collaboration with the SPŠ a SOU secondary school in Pelhřimov. The title will be decided at a tournament scheduled for 28 March. The first tournament in the Czech National Championships series will be the Spring Tournament on 29 March in Pelhřimov, followed by the Second Tournament on 27 September and the 9th Carrom Open Cup Prague on 15 November. The championship covered three tournaments, and the two best results counted towards the final score. Full rankings here. The winner is Dirk Polchow. Congratulations! More information on the tournament is available here. on 28 September. In an evenly-matched final that lasted over two hours, Filip Smoljak beat Ondřej Chmelař 25:19. Full results here. On Friday 27 September there was a tournament for students at the secondary school in Letohrad, who are being coached by Horst Šimunský. The winner was Lukáš Pavela, with Adam Šimák second and Radim Patkolo in third place. The Czech Carrom Association takes part in various events for the general public. In September it has had boards at Ladronkafest and Reclaim Your City, and it will again be at the Prague Indian Film Festival on 10-13 October 2013 . The winner of the European championships in Poland was Karnal Abdin (GBR), with Murshad Khan (GBR) finishing second and Fabian Pereira (FRA) third. In the doubles final Mehedi Hassan and Babu Saravanan (SWE) beat Malik Abdul and Ali Sunahar (GBR) 25:24. Czech doubles partners Honza Těšitel and Cyrus Skaria, were 28th. In the team competition France beat the United Kingdom and Germany. The Czech Republic finished in 7th place. New TCC champion! Full results here. Despite the cold weather the tournament at the SPŠ a SOU secondary school in Pelhřimov was well attended. On Friday afternoon there was a tournament for the school's pupils and the general public that attracted over 20 enthusiastic competitors. In the final David Mirský beat Martin Šmíd and won a carrom board donated by the school, which organised the entire tournament. On Saturday more experienced players competed in the Czech Championship series, with Horst Šimunský beating Filip Smoljak in the final. Full results here and photos here. 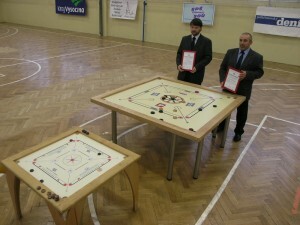 On 5 April 2013 the Dobrý den agency presented the biggest carrom board in the Czech Republic, measuring 164 x 164 cm, which was made by pupils at the SPŠ a SOU secondary school in Pelhřimov. When we decided to visit Karachi, many people told us we were crazy. When we said we wanted to go there for carrom, they told us we were even crazier. We are so proud we did this trip. We met so many nice people. Pakistani hospitality is really amazing. Thank you very much again. Thanks to all members of the Pakistani Carrom Federation. Hopefully we learned something for the future and we can help improve the standard of carrom in the Czech Republic. Pakistani carrom doesn’t have the same support from the government as other countries in Asia, but we’re sure that one day Pakistan will compete for the top places in world carrom. Support for women’s carrom in Pakistan is a great success, with a women’s tournament in Karachi. This is the right way to do it. This year the Eurocup will be held in Poland on 20-24 June 2013, not far from Warsaw. Detailed information is available here. In the new BAJKAZYL, in Žižkov in Prague, to the left of the entrance to the Karlín tunnel, you can enjoy a cup of good coffee and try your hand at carrom. The first tournament whose results will count towards the Czech National Championships will be held on 6 April. This year the Terrace Carrom Cup will be held on 25 May, as usual in Borek, near Pardubice in East Bohemia. The Second Tournament for the CNC will be held on 28 September. The final tournament in 2013 will be the 8th Carrom Open Cup Prague on 16 November. The PCL for 2012 finished on 6 December. The winner was Horst Šimunský, who consolidated his triumph in the Czech National Championships. Full results here. was held on 17 November and the winner was Tobias Krüger from Germany. There were almost forty players, coming from the Czech Republic, Germany, Poland, Italy and Sweden. Lunch was kindly provided by the Punjabi Food restaurant and the Čapátí shop. Photographs and more information on the tournament are available here. The 10th annual Prague Indian Film Festival will be held on 13-14 October in the Ponrepo cinema and 15-21 October in the Světozor cinema. There will be other attractions in the Světozor, including Indian food and an opportunity to play carrom. Full information here. was held on 6 October in the U Sálavců pub in Vysoká nad Labem. The winner was Zdeněk Sviták and full results are available here. The TCC was held in Borek, near Pardubice, on Saturday 19 May. In a surprising final Tomáš Chmelař beat Zdeněk Táborský 25:8. Full rankings here. will be held on 8 March 2012 from 7.30 p.m. onwards at the 3+1 café, Plaská 10, Prague 5. The first tournament that will count towards the Czech National Championships will be held on 31 March in the café of the Na prádle Theatre in Prague. This year the Terrace Carrom Cupu in Borek, near Pardubice, will be held on 19 May. The Second Tournament for the CNC will be held on 6 October, probably outside Prague – the venue will be announced during the summer. The final tournament that is part of the CNC will be the 7th Carrom Open Cup Prague on 17 November. You can also play carrom at the Dobrá trafika café at Korunní 42 in Prague 2. Local player Cornel D’Silva won the 3rd Polish Championships. Czech players performed well: Ondřej Chmelař finished 4th, Zdeněk Sviták 7th and Honza Těšitel 9th. See www.carrom.com.pl for more information.